WaveAccess has set up data integration between Microsoft Dynamics 365 (On-Premises) and Microsoft Office 365 cloud services for GoingRussia, a tour operator providing services for foreign tourists throughout Russia and the Baltic countries. Data migration and custom synchronization were implemented using SyncIT, WaveAccess' proprietary platform that allows for configuring synchronization between different sources of information in real time. By integrating the WaveAccess solution, GoingRussia was able to optimize workflows and increase work efficiency while the customer base keeps growing. GoingRussia used Microsoft Office 365 and Microsoft Dynamics CRM cloud solutions for several years to work with its customers: foreign tour operators, agency networks and online booking systems. At the same time, Office 365 services (mail, calendars, documents, tasks) were not integrated with the CRM system. Also, the company's CRM system was not synchronized with an Exchange, so two parallel databases of contacts and accounts existed: the Microsoft Dynamics CRM contained outdated information, while relevant data was maintained on the Exchange. It did not allow the company to efficiently work with their growing customer base or collect analytics on requests and sales. To optimize workflows, they needed to synchronize all existing data, update it and customize the integration of Office 365 and CRM system. Using the scalable and configurable SyncIT integration module, WaveAccess specialists managed to migrate data, eliminate the duplicates, and set up synchronization between the CRM system and cloud services. The WaveAccess solution quickly and efficiently migrates information from Microsoft CRM 2011/2013/2015/Online to Dynamics 365/Online, performs synchronization and integration with Microsoft Dynamics CRM, and imports data from any structured database to Dynamics 365. Synchronization is performed practically in the real time, which is the SyncIT crucial advantage. This did not distract GoingRussia specialists from their work and avoided any potential freezing of ongoing processes. "Thanks to the WaveAccess' solution, we automated and optimized workflows, which helped improve our managers’ work at all stages — from receiving a request, to its confirmation: employees do not fail to follow-up on inquiries and reactivate any “hung” requests. It made it possible to increase the level of materialization, which has a positive effect on sales dynamics. Now we also have the parameters set up for receiving reports — we monitor the current workload and specialists’ performance and analyze the results by different cross-sections. This enables us to run relevant promotional activities and take management decisions in due time. We want to thank WaveAccess for a quick and responsible approach. We particularly appreciate the fact that the project was implemented without interrupting our current working processes,” comments Aleksey Emelyanov, the Executive Director of GoingRussia. “Standard data import into a CRM system offers a very few opportunities — in particular, it is unable to create many-to-many relationships, and draw information from Excel. 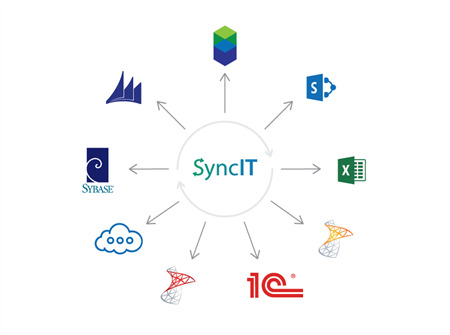 And SyncIT easily and quickly configures synchronization between two or more CRM systems, Exchange Server, SharePoint, Microsoft SQL, and any database that supports Simple.Data, Excel (csv). SyncIT is a customizable solution: we can build a special connector if a different data source is declared. Our product also covers specific scenarios such as migration of marketing lists, actions, documents and email attachments. SyncIT can be used both for a one-time data load and for two-way synchronization,” comments Ilya Feigin, founder and CTO at WaveAccess. There are more than 100 law, construction, real estate, and service companies in Russia and globally that have already enjoyed the benefits of SyncIT. We will be delighted to bring more details on the SyncIT platform!